Rane just announced its new Seventy-Two Serato DJ battle mixer at DJ Expo 2017, gunning straight for Pioneer’s DJM-S9. 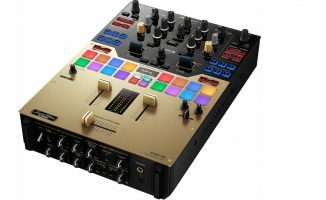 The Seventy-Two is a two-channel mixer that comes with a 4.3″ touchscreen onboard, and is compatible with Serato DJ and Serato DVS. The Seventy-Two is the heart of Rane’s “Battle Ready” system, which consists of the mixer and the Rane Twelve motorised DJ controller. 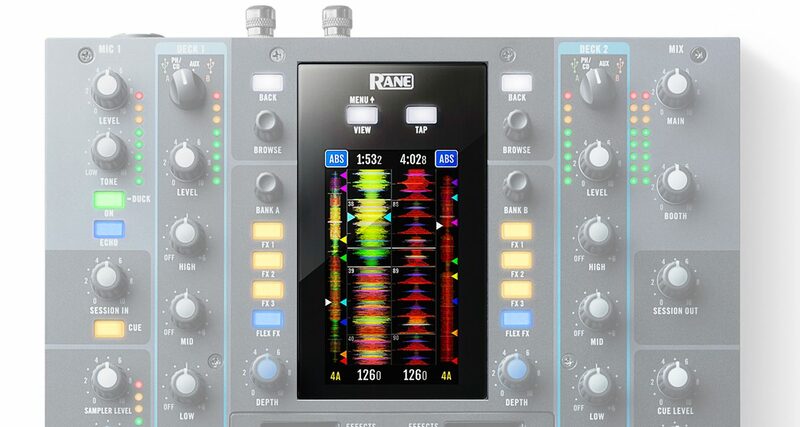 The Rane Seventy-Two comes with a high-resolution 4.3″ touchscreen. It displays vertical waveforms (just like what you’d see in Serato DJ) and also shows tracks in your Serato DJ library, plus you can use your finger to control the Seventy-Two’s Touch FX feature. You can also edit mixer preferences here. The Seventy-Two has three of Rane’s brand new Mag Three faders: one for the crossfader, and two for the channel faders. 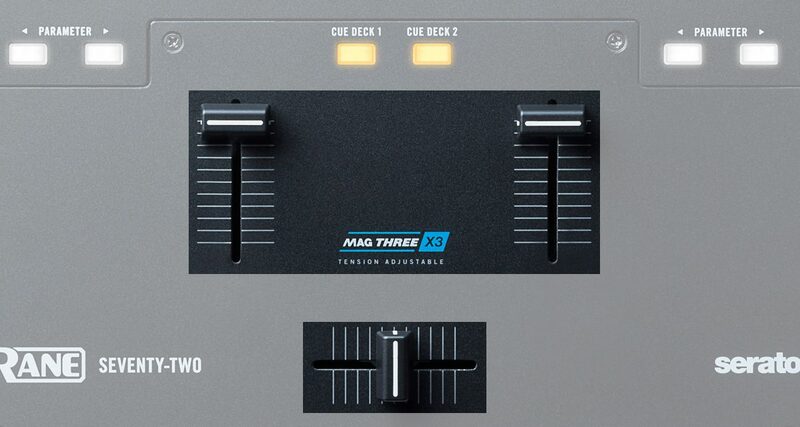 Each Mag Three fader has adjustable tension so you get the exact feel you want (whether loose or stiff), and all have adjustable cut-in and contour controls as well as reverse switches. Rane’s Seventy-Two mixer comes with its Flex FX engine onboard: each channel has one Flex FX channel, plus “stacked” Serato DJ effects. That means you can have up to four effects going on per channel (one Flex FX, three Serato DJ effects) for some intense sonic mangling. 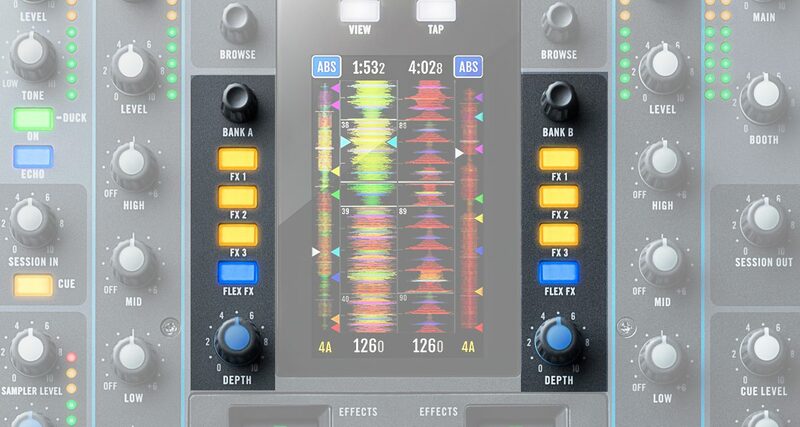 Each effect has an on/off button on the face of the mixer, and each channel has a depth knob too for extended audio manipulation. There are two effect paddle controls on the mixer as well: these look similar to the paddles found on the Pioneer DJ DJM-S9 mixer, arguably the current reigning king of scratch mixers. The pads have adjustable touch sensitivities along with the “aftertouch” feature, which means that the pads are pressure-sensitive. Round the back are XLR Master out jacks, 1/4″ Booth out jacks, RCA Session ins and outs, a pair of switchable phono/line RCA jacks and a pair of Aux jacks per channel, two combo mic inputs, and phono grounding posts for turntables. 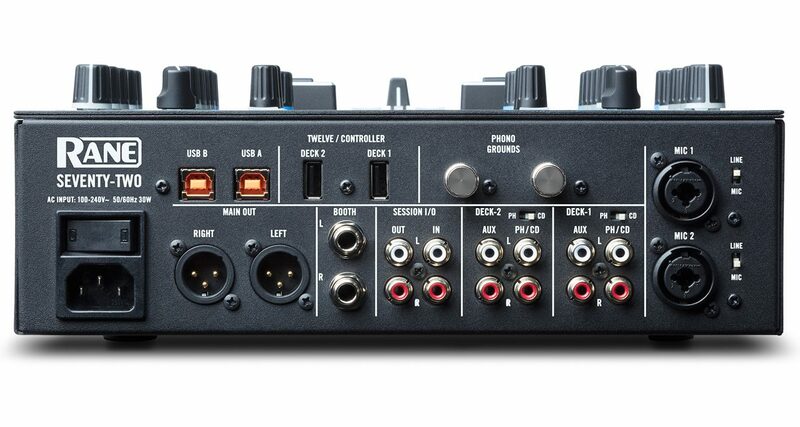 There are two USB output jacks for connecting up to two laptops (perfect for twin battle DJ routines or switchovers), as well as a pair of “USB Turntable” inputs. These caused a stir when images of the Seventy-Two first emerged last week (some thought that a hybrid analogue/digital turntable was coming out). Now that the Battle Ready series has been unveiled, it’s now clear that these inputs are for the Rane Twelve motorised DJ controller. 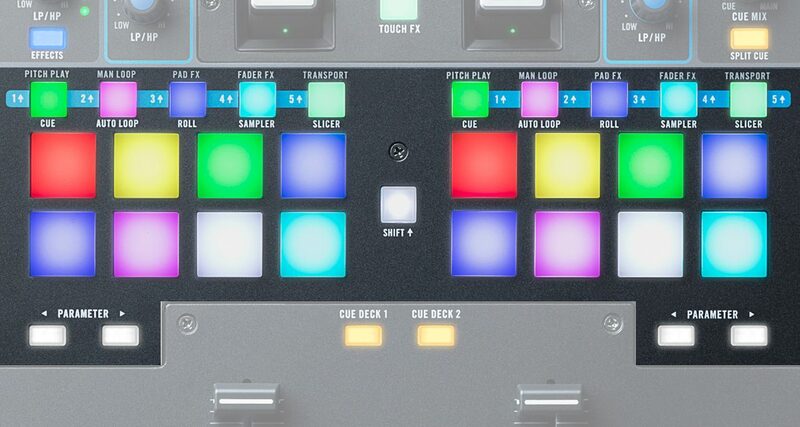 The front of the unit has controls for the mic 2 input, and you’ll also find the Mag Three fader contour knobs here along with the reverse switches per fader. 1/4″ and 1/8″ headphone jacks can be found here, a 1/4″ jack for connecting a Midi footswitch, plus a Deck Swap button. 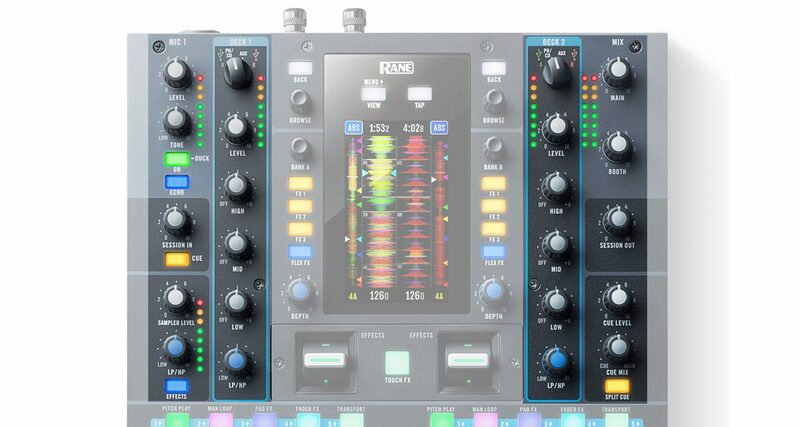 The Rane Seventy-Two’s mixer section has three-band EQs per channel with gain and filter knobs, along with a phono/line and Aux selector switch. It has a mic input with a volume and tone control, along with a volume ducking button and echo effect on/off switch. 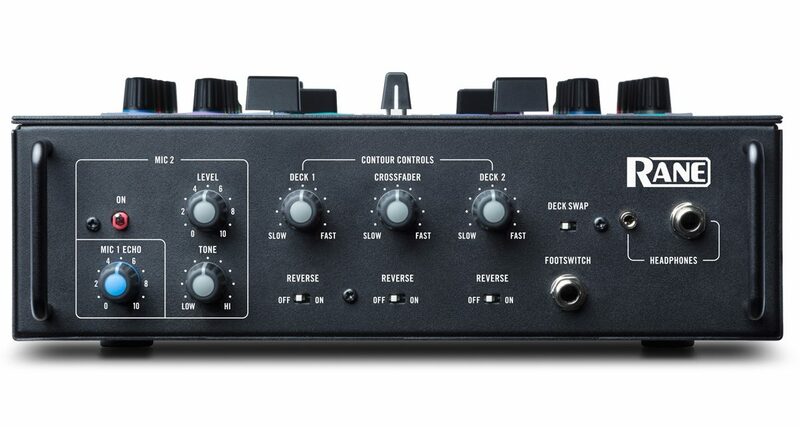 Other controls include a Sampler volume knob onboard with its own filter knob and on/off switch, Master output and Booth output knobs, headphone cue mix and level knobs, and Session In and Session Out volume knobs for controlling the Session channel inputs and outputs. 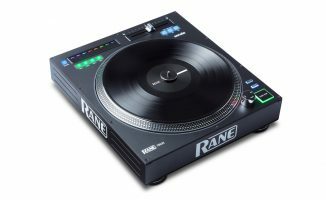 Rane’s new Battle Ready line places an intense focus on scratch DJs, and it shows: The Rane Seventy-Two looks like a serious contender to the scratch throne currently occupied by Pioneer DJ’s DJM-S9. 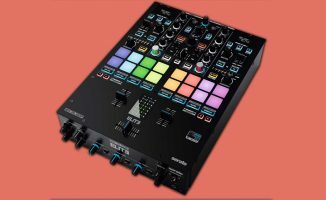 Apart from the obvious similarities (build, paddle controls, layout, and so on), the Seventy-Two goes one step beyond by adding in a touchscreen with waveforms that could make the laptop-gazing “Serato face” a thing of the past for scratch DJs. 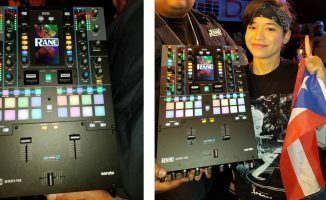 If you remember, Rane was in the news a little over a year ago when the company was bought by inMusic, the music giant that owns Denon DJ, Numark, and M-Audio, among other brands, and there were some fears that the quality of its forthcoming products would be diluted. 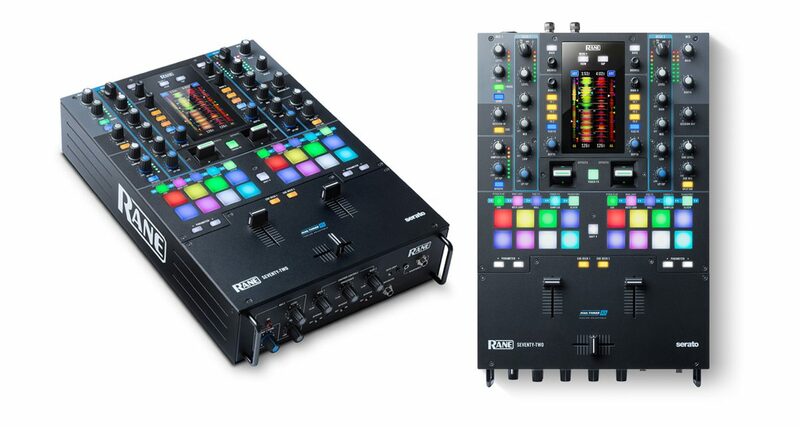 Thankfully, that doesn’t seem to be the case (at least at first blush) if we were to take Rane’s Battle Ready Seventy-Two mixer and Twelve DJ controller into consideration. Watch out for our review of them soon. • The Rane Seventy-Two will be available for US$1899 from 4th quarter 2017. Check the Rane website for more details. What are your thoughts on this new mixer? Thinking of getting it for your scratch set-up? What do you make of the mainstream resurgence of scratch DJing and turntablism as of late? Share your comments below.